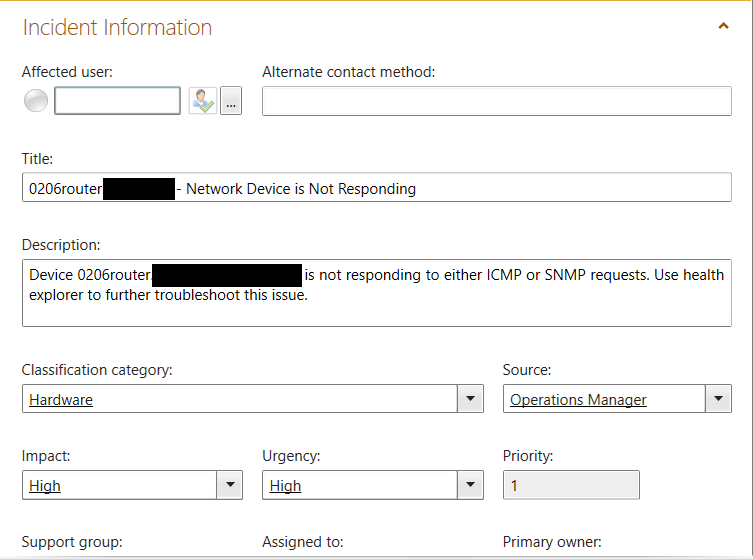 Forwarding SCOM alerts to SCSM can be very useful to allocate troubleshooting duties. However, Incidents created for offline network devices tends to provide less than useful information at first sight. It’s difficult to tell which network device each Incident is for. This is because the SCOM alert connector in SCSM is simply pulling the alert title from SCOM and placing it in the new Incident. The alert title for network devices does not list the affected network device. I have come up with a small Orchestrator runbook that will handle grabbing the affected devices name and appending it to the title of the Incident. Once these pre-requisites are set up, the runbook can be implemented. To use this runbook, download it here. 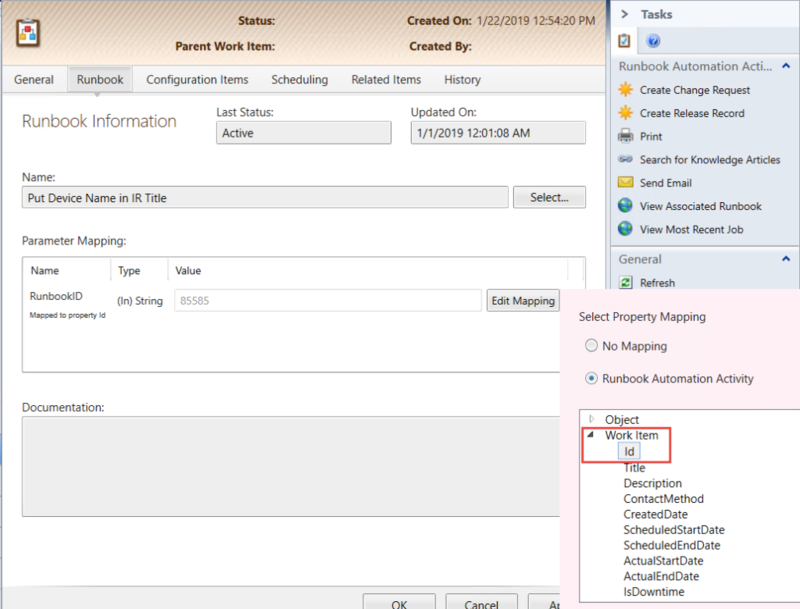 Change the Service Manager connection in each Service Manager activity in the runbook. This can be done by opening the file in any text editor. 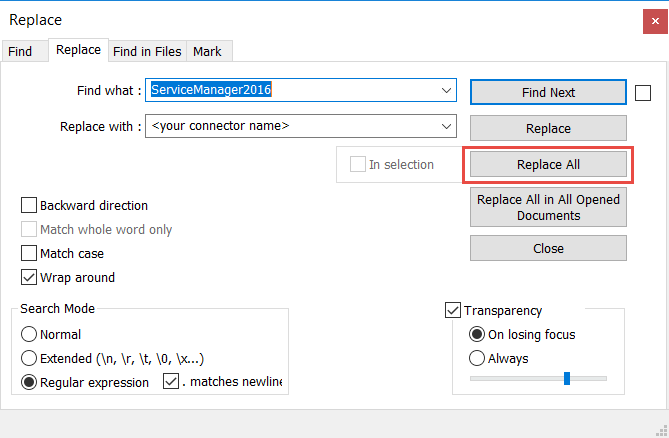 Do a find and replace to switch ServiceManager2016 with whatever the name of your connector is and select Replace All. Then, import the runbook into your Orchestrator folder that is synched to SCSM. Next, create a Runbook Automation Activity for it. In the RAA template, map RunbookID to Work Item>Id. After creating the runbook activity template, create a new Operations Manager-Generated Incident template for Network Devices. In that template, add the Runbook Automation Activity. Fill in any other details you want to for the rest of the template. After the alert routing rule is created, configure SCOM to forward the network device alerts to the SCSM alert connector. Open the alert connector in SCOM and create a new subscription. Select all groups in the subscription. In the Targets pane of the subscription, select the Nodes type, then save the subscription. Once the alerts are forwarded to SCSM, SCSM will use the new Incident template and the Runbook Automation Activity to append the device display name. This can be used for many types of alerts such as Failed To Connect To Computer. It can be used on the Windows Computer CI instead.